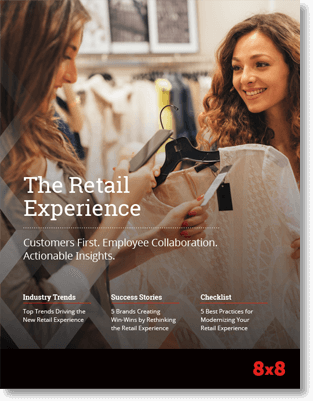 From increasing operational efficiencies to enhancing the customer experience, thousands of retailers have partnered with 8x8 to lower costs and improve customer service. Simon Silva at Bang & Olufsen provides detailed insight into how he is using augmented reality (AR) as a tool for retail—not as a gimmick, but as a way to increase sales and keep customers returning. 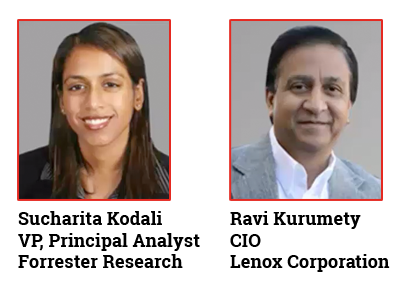 Get the latest insights into what successful retailers are doing and learn how Ravi Kurumety, CIO of Lenox Corporation, is reinventing the company’s brand experience. Reliable and clear communications have never been more critical than in today’s retail environment. With so much choice, customers can afford to be selective about the brands they engage with. The result is retailers are increasingly competing based on experience. Those retailers incorporating communications as a key component of delivering an exceptional brand experience are seeing outsized returns. 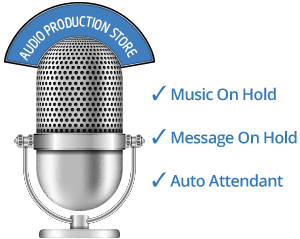 The 8x8 Retail Solution combines voice, meetings, team messaging, contact center, analytics, services and support into a comprehensive communications solution that enables retailers like you to optimize every precious moment of engagement with customers. Over the past decade, the role of the retail store has changed dramatically, yet one fact remains clear: the store provides an experience that cannot be duplicated in the digital world. This fact is driving a fundamental change in how retailers staff, craft and enable the customer experience—unifying it across all available touchpoints. Serving customers in stores, restaurants or other types of retail locations often requires associates to perform a delicate balancing act between interacting with customers on site and those calling in. Managers must supervise staff as well as maintain technical details like the integrated voice response (IVR) for store hours, number of lines, ring groups and promotions. To help manage the needs of both associates and managers, 8x8 has designed two service plans that lower the total cost of ownership while enabling a more effective way to balance responsibilities. Learn more about the 8x8 retail solution and how it can benefit both the store manager and store associate. The proliferation of communication channels makes collecting, aggregating and analyzing customer information increasingly difficult. 8x8’s Retail Solution combines voice, chat and email interaction channels with workforce management tools, enabling retailers to quickly react to customer inquiries and maintain the context and content of each engagement as it progresses through the buying journey. 8x8 has designed two service plans: one for contact center agents and one for contact center supervisors. The Contact Center Associate service plan combines the same collaboration and telephony capabilities of the Store Associate plan along with contact-center-centric functionality for voice-based interactions and integration with common CRM applications. For a multichannel associate or a contact center manager, the Omnichannel Associate service plan comes complete with a full suite of analytics, integrations and the latest contact center functionality, like Co-browse, quality management and outbound predictive dialing. Retailers lead the way with generating value from advanced analytics. The ability to understand and identify trends across the business and personalize each customer’s experience is no longer a nice-to-have; it’s essential to maintaining the high degree of agility and personalization required to be successful. 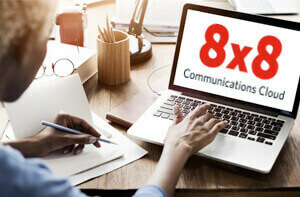 8x8 helps retailers collect and analyze interactions across the interaction points between stores, websites, the contact center and even the corporate office, in a way that enables better decision making and faster, more relevant responses to customers. 8x8’s single system of intelligence delivers data-driven insights, based on all of those customer interaction points. Managers have instant access to the information they need to better align resources with activity; deliver timely, fact-based coaching; and intelligently automate call routing. One of the greatest challenges in retail is updating multiple locations that may be distributed over a large geographic distance. Retailers can’t afford to have their stores disrupted for long periods of time or deployments that take quarters to roll out. Understanding this unique need, 8x8 provides a variety of deployment packages designed for the unique nature of retail businesses. The deployment options also take into account the availability and aptitude of existing resources, whether internal or from a designated third-party. 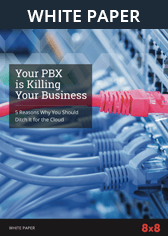 8x8 understands that without communications, customers, prospects, partners and employees cannot connect and collaborate. 8x8 has built a global network of operations and customer service centers to provide 24/7/365 follow-the-sun support backed by our Service Level Agreements for voice quality, system uptime and response time for support requests. Learn more about 8x8's support services. Retailers have enough to worry about without adding whether or not their phones, chat and meetings capabilities are working. 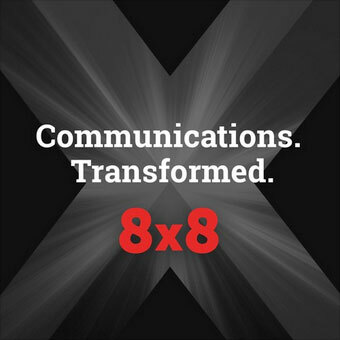 One of the main reasons 8x8 is consistently a Leader in the Gartner Magic Quadrant—the only 7 time Leader for UCaaS and the only UCaaS Leader that is also in the Gartner Magic Quadrant for CCaaS—is due to our commitment to delivering the best communications experience. With over 280 patents and pending patents, 15 data centers across the globe and highest levels of security and compliance, we are able to go so far as guarantee your call quality in the contract! Learn more about 8x8’s tailored packages, built to meet the specific needs of stores, administrative offices and contact centers.